In the few weeks since George has died, Dan, Sam Josh and I have been helped in our sorrow by the love and support shown to us in the visits of friends, phone calls, messages, gifts of food, flowers and cash, words of sympathy and admiration for George. June 2016Below are some of the comments made on Facebook, by email and on the online guest book Legacy. We're grateful for all of them. We hope those who haven't commented will do so. Today, we mourn the passing of our brother George Schmidt, who has left a tremendous legacy as a champion of labor and the schools our students deserve. Our thoughts and prayers are with George's wife, Sharon, his family and the lives of all he touched. Katie Hopkins Sending prayers of comfort to his amazing and supportive wife Sharon, their boys, family and friends. What a legacy George has left us. Let’s continue to stand up for our schools and our students in his honor. John Kugler Warrior for Justice!!! Maria Guerrero He was very devoted to Substance and unions. His dedication will be missed. Deidre Daly Thoughts and prayers to George’s family. I didn’t always agree with him, but I always respected him for his activism and standing up to initiate difficult conversations. Ann Geocaris Great man. Will be missed. Carol Kaim He will be missed. My condolences to his family. Mary Beth Noonan He fought for us his entire career...prayers for his family. Wilfredo Santana RIP, George Schmidt. Outstanding labor leader. Boleslovas Danielius Rest in peace. A true warrior for the schools our children deserve. Eurydice Chrones I always enjoyed his in-depth and heartfelt journalism in Substance News. My condolences to his family. Catherine Teresa IV RIP, George. You certainly will be missed. Thanks for your dedication to our union! Amy Mars Sending light and love to you, Sharon, and the boys. I’m so sorry. Susan Hathaway Tantillo My heart is with you, Sharon. Hugs. Kathie Cantone So very sorry for your loss! One of the heroes of the fight! Kati Gilson Beautiful pic. Such a loss. Penny Bublitz Campbell So very sorry, Sharon. We will be continuing to pray for you and your family during these difficult days. Catherine Cunningham I can’t even believe it. 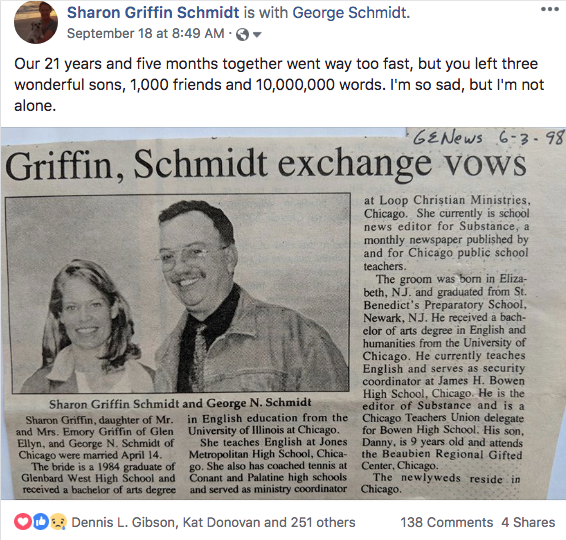 Sharon Griffin Schmidt please accept my deepest sympathies. Marco Kalogeras I am so sorry for your loss. God Bless you and your family during this difficult time. Cielo Munoz Sharon, I’m so sorry for your loss. Debby Pope Please accept my condolences. I am truly sorry for your loss. Bobbie Hayes I'm truly sorry for your loss. Grady Jordan Hey yall still looking GOOD!!! Kelvin Sandridge SO, so, so sorry! Jan Recinos Wow what a sad loss! Kirstin Roberts Beautiful picture. So sad to hear this news. Dianne Illiano Yonkers He was fearless in exposing stupidity, foolishness and criminality. He put himself on the line in order for us to understand what was happening behind the scenes. May he rest in peace. David Fingado George was committed to the truth. Thank you for your legacy. Carolina Gaete Rest in peace. You know he will have lively discussion with God. Michael J. Harrington George was a great man and model, all about the truth and transparency from the day I met him in the early 1980s. Patricia Boughton Maybe George's spirit will haunt the halls of the haughty. Les Slater Yes, that’s what happens when you have a significant impact, nobody escapes your spirit. Romel Ferguson May his soul be at peace! 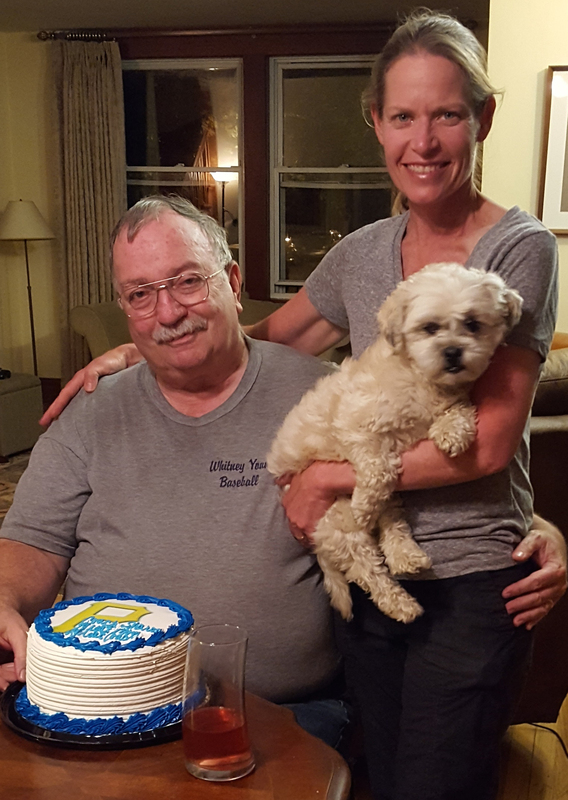 Ginny O'Brien My condolences to the Schmidt Family. Rest In Peace . Valerie F. Leonard He gave me the toughest time when we first met. He thought I was part of "The Establishment". (I don't know HOW he got that idea, LOL) Once we had a chance to have lunch and talk, he was able to see otherwise. He covered every issue that I presented to him concerning North Lawndale schools. He gave voice to those of us who would never have been heard otherwise. Oh, I will miss him! Julie Vassilatos I always knew that what was reported in Substance News was going to be the most accurate. What a loss on so many levels. Tina Bea A lifelong fighter. We will remember. Pamela Touras-Andrikopoulos RIP. May his memory be eternal. Raymond Wohl George was a fighter and an original and one of my favorite union brothers! Jim Vail A giant for what he accomplished. Joseph McDermott Always had a story to tell. He contributed to CTU for decades. We are all better off because of him. David Benjamin George helped me out when I was a brand new teacher. He guided me through a time with another crazy administrator. His guidance was priceless and gave me a fighting spirit. Lory Nowak So sorry. He was inspiring. Patty Mitchell I had the opportunity to sit down with George one cold winter day for breakfast when he advised me on how to handle the powers to be, he was right on point! Great advisor, great colleague. He will truly be missed. Francine Greenberg Reizen Rest in peace, George. You gave much to so many and you will be missed. William Cala A tragic loss to the educational community. Substance gave us the real inside of CPS. Maria Torres A huge loss to those who knew him. Norm Scott George had a lot to do with bringing many of us together. He was a magnet. And his voice is so needed more than ever. Richard Prince A man of Substance! Lourdes Guerrero Boy, did he piss off a lot of people. And I got a kick out of him. Rest in peace, George. Joe Guzman When covering the Chicago Public School Board Meetings....he taught us to shout out..."Get your hands off me..!" when Board security became feisty. Ann Cata I knew of George while I was a teacher at a CPS school. I read his Substance news faithfully. Saw him in person at delegate meetings and knew he stood fast at the rights of educators and showed CPS no fear in exposing the truth. We need dozens more like George. May he Rest In Peace. Dianne Crawford Oh no. My condolences to his family. I've been reading Mr. Schmidt's articles for years, and he kept me and many others abreast of issues related to Chicago's school system, the union, politics, etc. May he rest in peace. Arathi Jayaram Oh that’s so sad. I only met George a few times at CORE meetings. He was so friendly and made me worry less, with being new. Ed Dziedzic Courage and integrity. He will be missed. Raymond Wohl George was fierce and that meant that he would argue even with his allies. Michelle Klein He will be missed. Kim Scipes George was the best. He only wanted the best for working people, and especially teachers. Don't rest in peace, brother--keep raging on, for the issues you fought for have long been important and will still be important for a very long time. Presente! 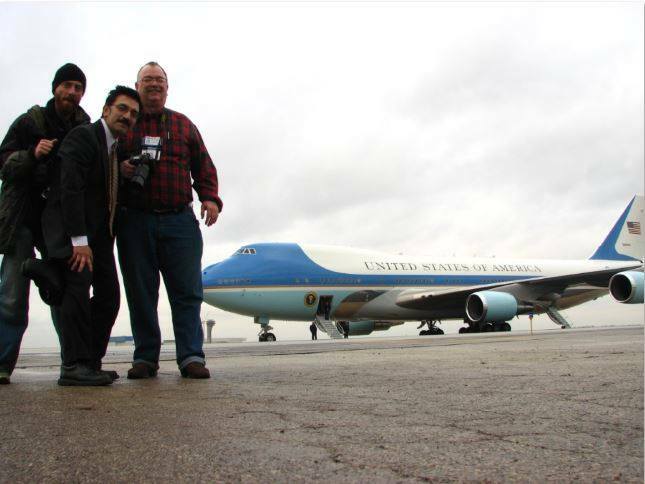 Joe Guzman (middle) and George covered George W. Bush at O'Hare Airport. Joe posted this photo with his Facebook post on George's page. 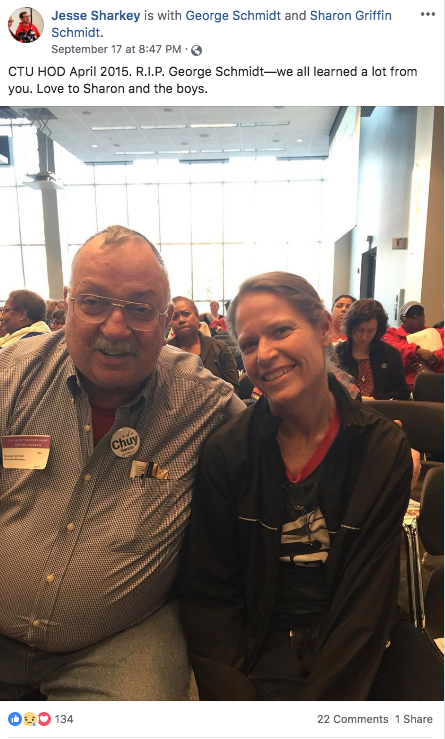 Theodore Dallas‎ George was the conscience of the CTU! Rest in peace. ‎Jacquelyn Price-Ward‎ Happy Birthday George RIP. Vinni Hall‎ He is missed. Blessings to your family on his birthday. Bernie Eshoo‎ Thinking of George today. — remembering those who are no longer with us. Kim Goldbaum‎ It would be your birthday. Hope you're good! Norm Scott‎ Wish you were here to celebrate George. Joe Linehan‎ Rest in power, George! You’ve left behind an amazing legacy. Alvin Thompson‎ Happy birthday in Heaven, George! Heather Stelnicki You will be missed. You made your mark in this world. You had a positive impact on people's lives. Jeremy Cohan‎ Rest well, George. So many of us learned immeasurably from you about what it means to be devoted to a cause, about the class struggle, about speaking truth to power. Your "Notes of a Nattering Nabob of Negativism" live on. 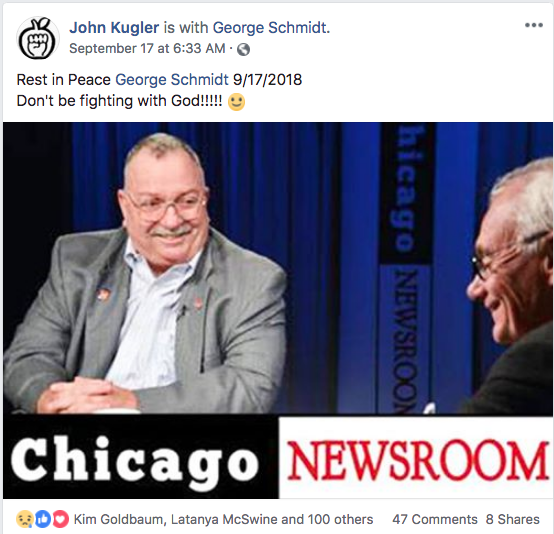 George Schmidt rest in eternal peace. You impacted so many lives and your legacy lives on. Donielle Lawson‎ Like EF Hutton when you spoke, everybody listened. September 17 at 6:41 PM · So sorry to hear of you passing George. I learned so much from you and I am grateful for that. Joseph McDermott George was my guy! Jan Recinos Sorry he left you so soon! He was an interesting man! Catherine Cunningham Sharon, my deepest sympathies. He was an awesome giant and I am happy to have known him. Sending you and the boys peace and love. Bernie Eshoo George was a giant presence in CPS/CTU since the 70s, I don’t like to even think about him being gone. If there was a big problem in the schools, the natural question was ... Did you call George Schmidt?. He will be sorely missed. Katie Osgood Sending you and your family love. George was a powerhouse. He was the first person to teach how to write a grievance! He will be missed. Rachel Parenti Rezny Wow what a legacy Sharon! So sorry for your loss! Norm Scott So sorry for your loss. A loss for everyone who knew George, larger than life who will always be with us. Zulma Lopez-Rivera My deepest condolences. I'll be praying for you and your family. Francesco Portelos So sorry for your loss..
Sara Soto I’m so sorry for your loss, you’re in my thoughts and prayers ❤️ May you find comfort in these difficult times. Candace Bowen Thinking of you and your family, Sharon. Holding you in my heart as I know you will hold many precious memories.